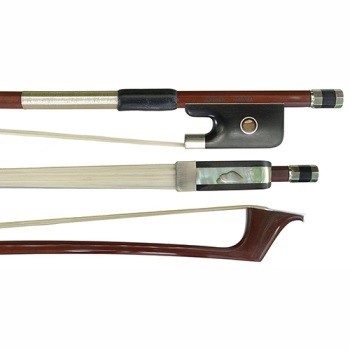 This is a very fine carbon fiber cello bow, but it retains a more traditional appearance than most carbon and composite bows, making it an ideal choice for the serious cellist seeking the benefits of a first-class carbon fiber bow (flexibility, imperviousness to humidity and weather changes, durability) while maintaining a traditional aesthetic. The carbon fiber material is a medium orange-brown hue which appears to be pernambuco, and only upon close up inspection is the textile-like carbon fiber weave apparent. The bow sports a nickel silver tip plate, and a fully lined ebony frog with Parisian eyes and a mother of pearl slide.